Soak the dhal for 30 mins. Drain water and grind into a coarse paste. Grind pepper & cumin seeds into a coarse powder. Mix grinded paste, powder, rice flour, salt and hing. You can sprinkle some water but the batter should be thick. Heat oil in a frying pan. Take one small lemon size of batter and keep it on the plastic sheet/cloth and flatten it with fingers like thattai and make a hole on the centre. And gently take out and slip into the hot oil. 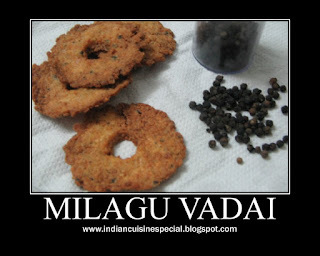 Turn the vada to cook other side. Take out once the vada becomes crispy golden brown color. You can fry more vadai depending on your pan size.